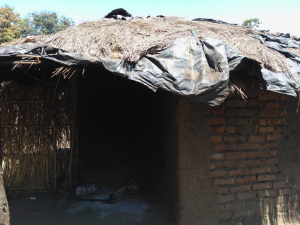 It is 98 km from Mangochi boma in area called Mvumba village, Traditional Authority Nankumba. In this area I met a lady, very old lady who does not remember her age. As soon as I laid my eyes upon her, something moved within me for I realized there are people out there living a life below the belief of existence. As I approached her home, she was seated on a dirty rug and basking in the sun. She smiled as I made my way and sat next to her, I gave her a hand shake, her hands were so fragile and cold and she was shaking. Her name is Felia Yohanne and she is a widow, her husband passed away 6 years ago. In her life she has had 15 children, however now she only has a daughter and son, as the rest had passed away. She explained on how her husband had managed to support her when he was alive and how things were much easier and accessible. Currently she stays at a house her nephew had built as her home fell due to the weak structures it had. I asked her if she was ever going to rebuild her home but she said she did not have the finances to start that. Furthermore both the daughter and son show no interest in helping their mother. Felia Yohanne was seated on a dirty rug, and her clothes were dirty and smelled of urine. Her personal hygiene was that of an old lady who can no longer look after herself. She manages to get up using two sticks for support, she has to crawl about 30 meters to get to her bathroom were she tries to wash herself as there is no one to assist her. In the past the daughter used to bring food for the mother (Felia Yohanne) but currently she has stopped as she is also looking after her family. 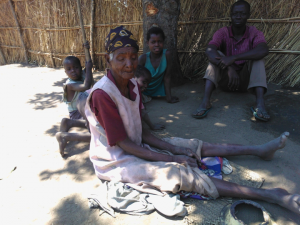 She is in this state because the son and daughter sold all her maize and left her with nothing. She usually eats nsima with fish, nkhwani(pumpkin leaves) and thelele(okra). However she goes without food for two to three days, eating depends on the availability of food.